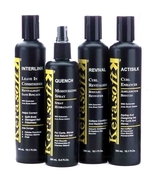 We believe Kerasoft® hair care products to be the finest black hair care products available anywhere for Black hair, Afro-textured, natural and curly textured styles. These superior black hair care products were developed using only the highest quality ingredients available on the market today. They are designed to keep your curly hair in its healthiest condition, whether you are wearing your style straight, processed, Wash & Wear, or in a natural look. Hair with curl, that is not only beautiful on the outside, but also on the inside-begins with Kerasoft® hair care products. Through years of extensive laboratory research and continuous in salon testing at Jazma, Kerasoft hair care products were perfected. This incredibly unique curly hair care system will improve your hair and scalp's health, providing immediate results that you can feel and see, making you style picture perfect. 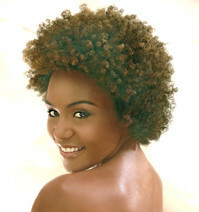 Healthy, beautiful, curly, coily hair is our passion. At Jazma we have advanced the ways to achieve this goal to a new level through the use of our innovative styling techniques developed for hair styles with strong, natural curl texture over the last 35 years and our specialized use of naturally curly hair care products specifically designed for naturally curly hair. The result; longer, stronger, healthier hair - touchable hair with shine, body and movement. 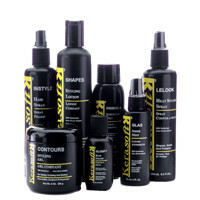 Our unique hair styling techniques, combined our salon's development of Kerasoft® products, has brought a whole new dimension to the styling of super curly textured hair. 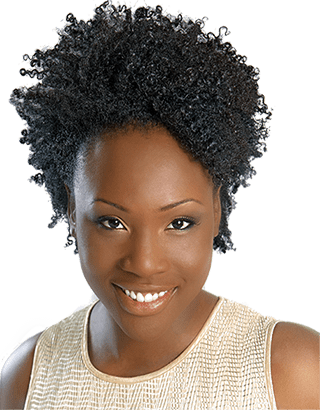 By making these important advances our salon has earned an international reputation as the experts in black hair care with super curly, relaxed and texturized styles. We are also very proud of the fact that Jazma has been rated by Essence Magazine as one of the best hair care salons in North America. Located in heart of downtown Toronto, at our elegant salon, where natural finishes abound, you will experience our committed customer service, where the client always comes first. 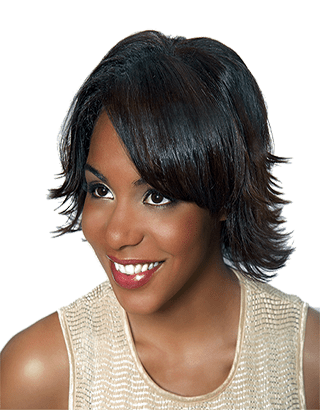 Jazma has an exceptionally skilled and highly talented group of stylists whose designs for years have been featured in Sophisticate's Black Hair Magazine and many of the other popular hair magazines to be found at the magazine stands. Our styling team members have won numerous hairstyling awards and our reputation for excellence in naturally curly hair care education has won Jazma the respect of the beauty industry around the world. 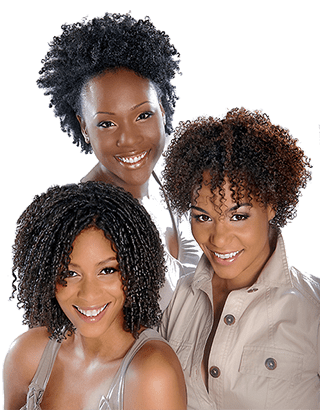 Our skilled team of stylists are pioneers of our revolutionary Wash & Wear Relaxer ™ semi-natural hair care system, which offers women with natural - super curly textured hair, the freedom and versatility of wearing their hair semi-natural, or in straight styles when they desire. 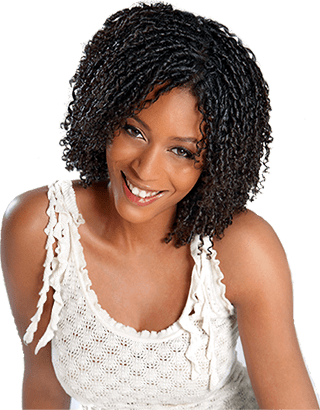 The Wash & Wear Relaxer has become the easy to care for hairstyle choice of women with tight textured curly hair of all ages. Have mixed textured hair?... - hair with varying degrees of curl strength mixed together - our system can blend multi- textured hair to one even textute. Our salon offers in-depth consultations that are for no charge* when you have a service appointment. During your consultation a body and facial shape analysis are performed, and we offer our professional advice and suggestions, on just which haircuts and hairstyles would best suit you. During the consultation we also analyze a short strand of your hair on our analyzer to determine what its strength, porosity and elasticity are. This information on the condition of the hair is crucial when dealing with Black hair or super curly textured hair. If you are experiencing problems. For more information and answers on hair care and hair growth, please visit our Questions & Answers forum. After your consultation we will give you advice on just what you should be doing to get your hair in the healthiest condition possible. We will also explain some of the misconceptions about caring for super curly textured hair, plus proper use of flat irons in straightening hair for smooth textured looks. Plus, when it comes to caring for Black and naturally curly styles not all products are created equal. Our hair care stylists will prescribe the correct products that you will require to help accomplish your black hair care goal. Our hair stylists will also spend time to instruct you on the proper use of the products that we recommend as well as sharing many useful tips for great style results at home. Super-curly textured hair, and its correct care, is our focus and life's work, so, whether your hair is natural, relaxing straight, short or long, Afro, naturally curly, texturized, styled in twists or freshly out of a weave, braids or dreadlocks and it just doesn't look and feel the way you would really like it to, there's a reason and we can definitely help. Problems with growth?... we can help. It's not only time to stop thinking about getting your hair back into a healthy state. It is time to do something about it, give us a call! While our salon is upscale in design, our stylists are down to earth people who are true masters in caring for super curly hair. Why don't you call our salon today and book in for a consultation*, it doesn't take long. The expertise that will help your hair become healthier, longer, shinier, and more manageable, is just a phone call away! Please call us at (416) 928-1888 and we'll be happy to get you booked in and on your way to the hair you desire. 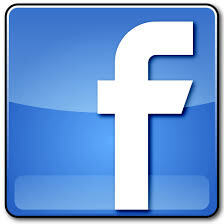 * The cost of our initial consultation is $25.00. This charge will be fully deducted from your first styling service for up to 8 weeks from the date of your initial consultation. * Our salon wants you to please take note that each and every picture of the models' hairstyles, displayed throughout our entire website, as well as in our Photo Gallery, were done personally by the Jazma Artistic Team using our line of Kerasoft Hair Care Products. We want to assure you that the style you see in any of the pictures or videos is of the model's own natural hair and these photos were taken without the use of wigs, hair pieces, weave pieces, extensions or additions of any kind. Our styling skills and the healthy condition of our models' hair we feel is evident in every photo. For thirty five years we have been helping our clients achieve healthy, great looking hair. We welcome you to come and visit us at our salon and we also invite you to try our line of Kerasoft curly hair care products. To see the real deal. please take a moment to visit our Instagram page where you will find real clients showing the work we do everyday to get their hair in its healthiest condition. Thanks for taking the time to visit our website. When you blow dry your hair before curling, blow dry it to a point where there is still a slight bit of moisture left in your hair. Do not blow dry your hair completely dry, before curling and styling, this allows less heat for less time when curling, as a bit of moisture help set your style quicker. It's kind of similar to when you iron clothes. It's best if they are just a slight touch damp before ironing, as if they are completely dry, you mist them a little with a water bottle just before ironing, this way they will take the heat from an iron faster and hold the press longer than if they were ironed dry. Similarly, if your hair is dry, give it a very light misting with a water spray bottle to bring up its moisture level, before curling. When swimming, please avoid chlorine. To do this, wet your hair down, soak it with a conditioner and then wear a swim cap if possible. Once the hair is saturated with water, and loaded with conditioner, it will not absorb the chlorinated water as it normally would. We can effect the form or shape that hair can take in two ways. The first way is through temporary form methods. These temporary ways may be through the application of heat by such implements as curling irons and hot combs, or by wet setting the hair then going under a dryer, or just naturally air drying a style. The second way is a more permanent one, through the application of chemicals to the hair such as relaxers or permanent waves were permanently we alter the shape of the hair's internal bonds.